New York City ski bums are something of a rare breed. There’s a special kind of stubborn resolve required to juggle a love for this town and a love for sliding down frozen mountains. No matter where we are, we’re always a bit torn, a bit displaced. I’m a city kid born and raised, and unlike many of those I grew up with and around, I’ve somehow held on in this unforgiving town while friends and family have been scattered either to the suburbs or to more laid back cities in other states. Despite skyrocketing rents and the promise of better jobs elsewhere, I’ve clung desperately to my hometown. I’d never once considered leaving – until I went skiing for the first time three years ago at the age of 42. The time since has flown by in a manic spasm of episodes that consist entirely of me exploring new mountains, planning to explore new mountains, and watching videos of other people exploring mountains. Now I find myself pulled away from home regularly. Family keeps me anchored on the western edge of a sandbar, but snow draws me north. New York is not the easiest city in which to feed a ski habit, but I’ve somehow been able to string together an average of more than 70 days during each of my first three seasons on skis. It hasn’t been simple, but there are a few tricks I’ve picked up along the way that have helped me stay stoked in this decidedly un-stoked town located three hours south of the goods. The first and most important is to go where the snow is. Of course, family and group trips need to be planned ahead of time, but one of the keys to making the most of a Northeastern winter is to have a work and home schedule that is flexible enough to make last-minute plans to go where the skiing is good. 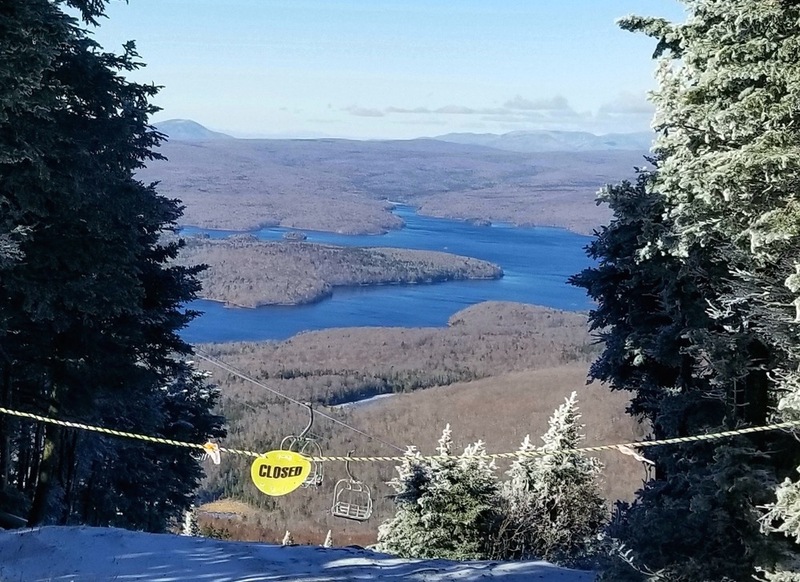 For example, until a few weeks ago the prevailing weather conditions had me convinced that the earliest I’d be able to get back on skis would be the week after Thanksgiving – the traditional opening day weekend for many Northeast ski areas. But as our warmer-than-usual autumn weather pattern snapped and a long string of snowmaking-worthy days set in, I began to get excited that I might be able to ski before Thanksgiving. And just like that, my first surprise Vermont road trip of the year was born. So that’s how I found myself on the Triborough Bridge at 4 a.m. on the Thursday before Turkey Day, on the road to Vermont, singing along to my favorite playlists and feeling like a kid on his way to tear open his presents on Christmas morning. It rained – mostly in fits but occasionally in sheets – and the roads were slick for almost the entire drive toward Okemo, but I had faith in Ullr. 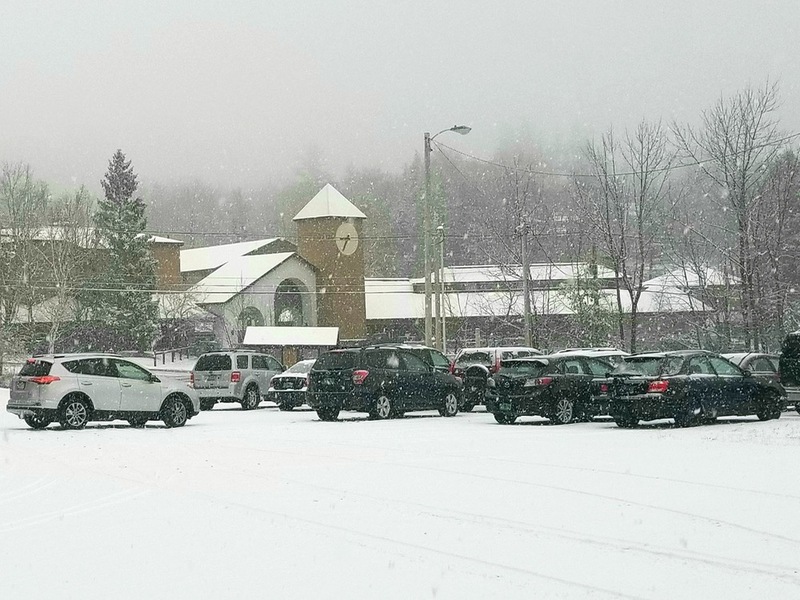 About ten miles from my destination the rain transformed to sleet, then to snow, and by the time I pulled into Okemo’s parking lot the entire mountain was coated in a thin fresh blanket of heavy white fluff. It wasn’t quite enough to call it a powder day, but it was definitely an unexpected bit of precip luck on a day where I thought I’d be navigating my way down the traditional early-season east coast white ribbons of death. Wet, surfy snow was underfoot the entire day, and I fought it with glee as I ripped down the same two top-to-bottom runs that Okemo had opened. It was the sort of gorilla snot that helps to seal a new base, boosting my hopes for the rest of the season. And though it was great snow for base building, it was torture on my summer-melted quadriceps. As a relative newcomer to skiing, I’d resolved to remain more active during the summer and began hiking in earnest for the first time in my life. On about 30 different occasions, I’d spent hours climbing the Catskills, the Adirondacks, and the Sierra Nevada mountains (on two separate trips out west), hoping that it would both help me with my general fitness goals and also help keep my legs in shape for ski season. None of that mattered on my first day back, fighting sticky slop that wanted to rip my legs apart. No matter how badly I wanted to just open up and rip down a run or two, my quads simply would not allow me to bust through the sort of resort chunder that last April I would have sneered at. Early-season muscle atrophy is no joke; opening weekend is a time to take it easy and find your legs again. So that’s what I did, dialing it back and saving some of my strength before I hopped back in my Jeep (Tip #3 – the further you live from the hill, the more snow you will need to drive through to get there; own a 4WD or AWD vehicle with snow-rated tires) for the hour-long drive down to Mount Snow, which had also opened the week before, and where I had plans to meet two friends the following day to explore the snowmaking capacity of southern Vermont’s largest ski area. 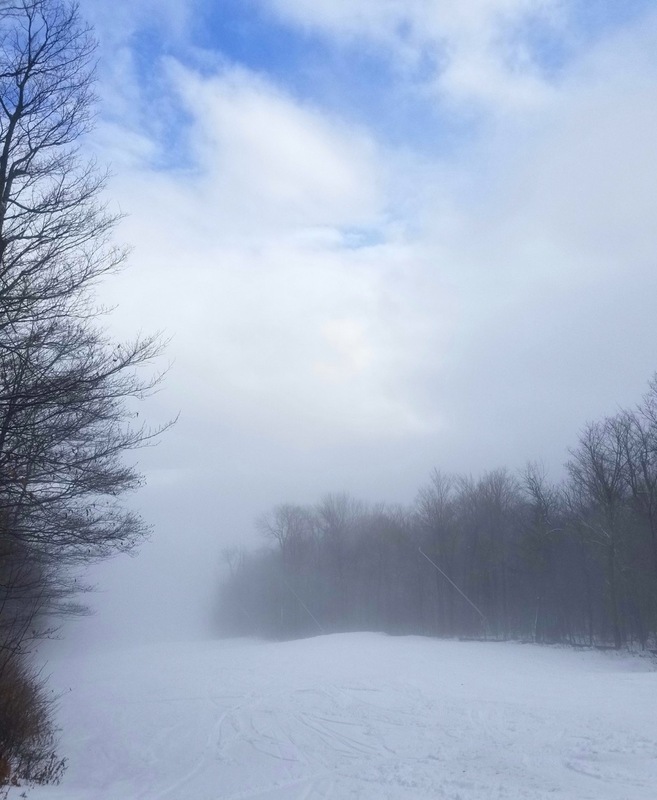 The previous day’s wintry mix had hardened into crispy ice, but the Mount Snow grooming team did a great job of preparing the mountain for the weekend, and each of the four main trails remained carveable and fun all day. The three of us spent the next six hours lapping the Bluebird bubble chair, finding our rhythms again, and talking about all the skiing we hope to do during the rest of this season. And despite quads that had now endured their second day of seasonal abuse, I decided at the end of the day that I was having too much fun in November to stop now, and since my wife was out of town and there would be no marital penalty (Tip #2) for extending my impromptu Vermont road trip and head back north along Route 100 toward Killington to spend my first Saturday on the slopes. I snagged a room at my go-to Killington hotel – the Mountain Sports Inn, a down-to-earth, welcoming, family-run home away from home that has all the ski town necessities, including a real hearth fire, hot tub, free breakfast, and a ski tuning area. It’s the sort of place where you’re as likely to meet the owner in the dining area over breakfast as you are later in the morning at the top of your favorite trail. The best ski town innkeepers are those who are there for the same reason you are. The rain forecast for Saturday morning had been pushed back to Saturday evening and resulted in a smaller Saturday crowd than I’d expected – even for an early season weekend. 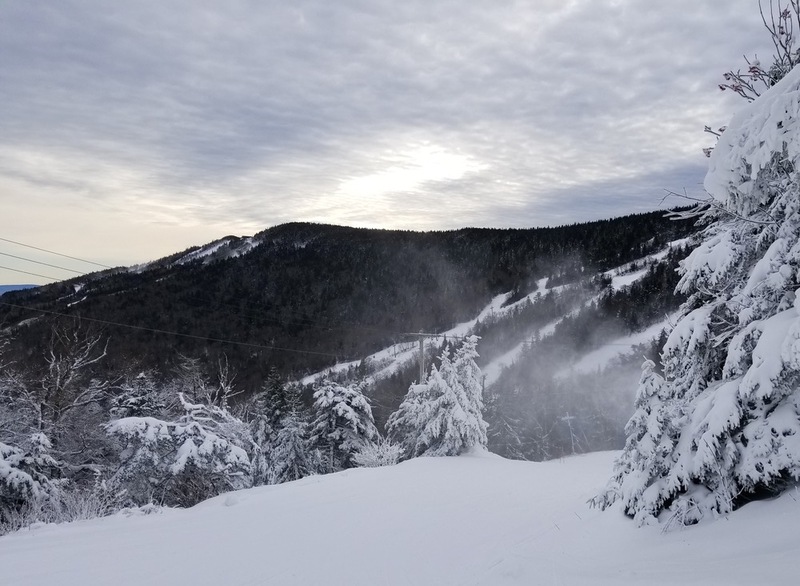 The snowmaking team at Killington was putting the finishing touches on the World Cup terrain over on Skye Peak, but they were also busy working on plenty of terrain on the Snowdon side of the resort, including the deep bumps carved into Upper Downdraft. The K-1 Gondola was running, as was the North Peak Triple, and the 10 open trails they accessed were more than enough for all of us who ignored the possibility of rain and turned out to ski on some of the most reliably grippy early-season snow imaginable. And sure, by this point my legs were so wrecked that I needed to stop multiple times on my way down Great Northern, fumbling awkwardly with my cellphone so that it would look like I stopped because I needed to take a really important phone call when in reality I just needed the thigh burn to stop for 30 seconds. And I felt zero guilt when I tapped out at 2pm, sliding back toward the K-1 Lodge on wobbly legs, and changed clothes for the long drive back home to NYC. Vermont has a couple of highways, and everything else is basically winding country backroads. I wanted to make my way to the Interstate by nightfall. But the Green Mountain State wasn’t done with me yet. 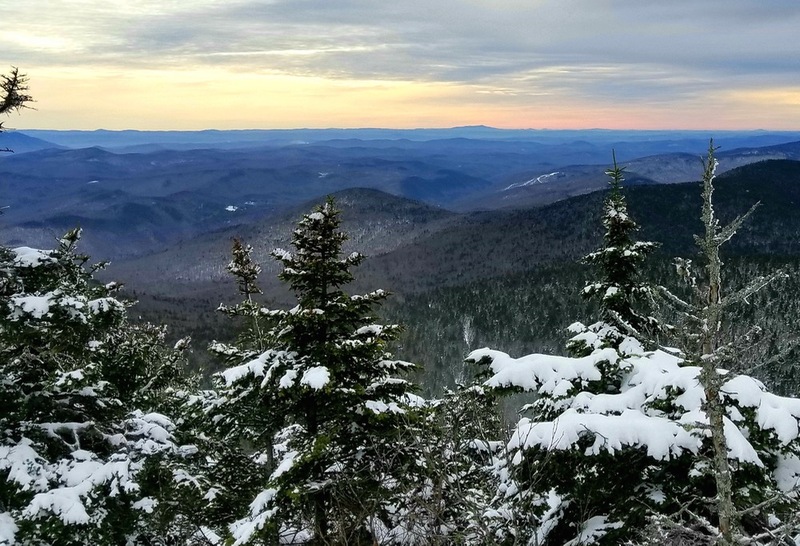 There are basically three main routes from Killington back down to NYC – the Thruway, the Taconic, or down I-91 toward I-95 through Massachusetts and Connecticut. The New England route saves money (no Thruway tolls) and avoids having to navigate New York State’s most accident-prone highway at night. 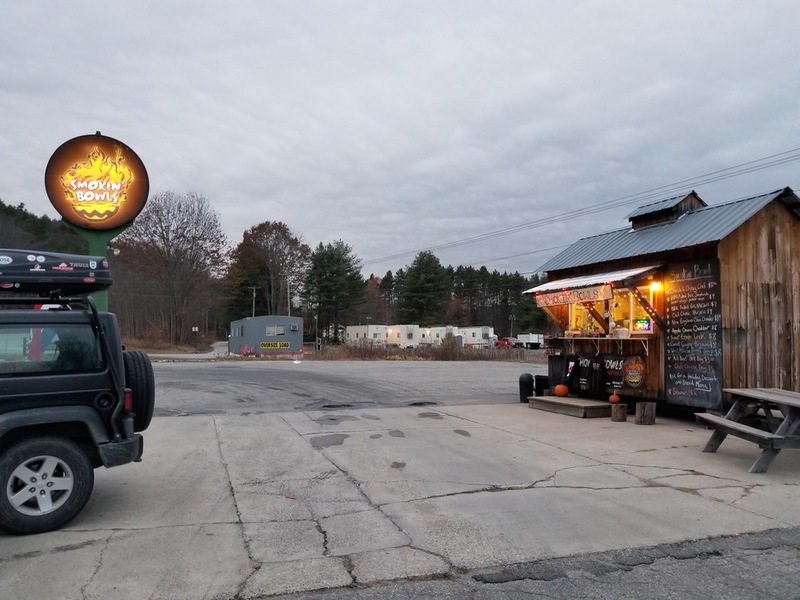 But an unadvertised bonus is the small soup shack that is open on a somewhat irregular schedule at the intersection of Route 103 and I-91 that is the perfect capstone to a day of shredding in the cold. And it comes at just the right time – an hour after I left Killington, I arrived at Smokin’ Bowls, which had always struck me as one of the most Vermont businesses imaginable (a roadside gourmet soup truck with a blatantly weed-friendly name that keeps its own hours) but had frequently frustrated me as I had passed it literally dozens of times – admittedly mostly during off-hours – and found it seemingly open but unoccupied. But not this time. 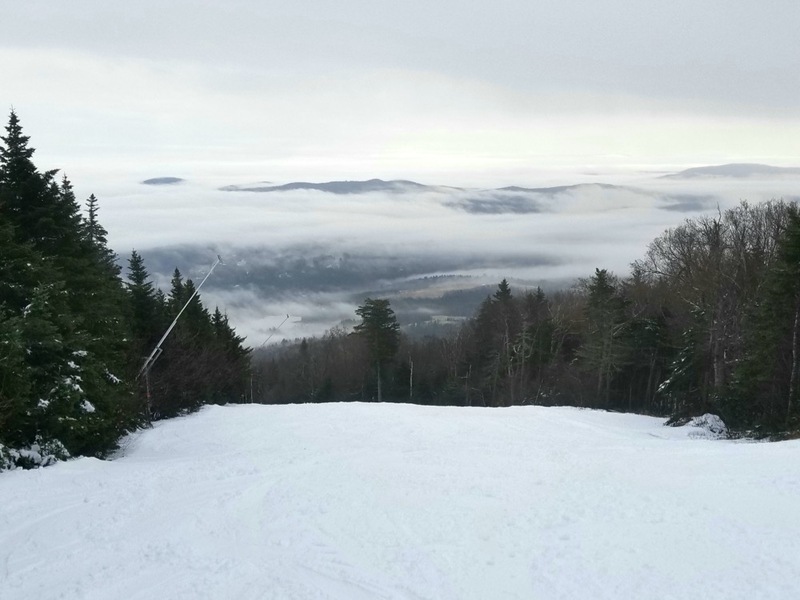 This time, Smokin’ Bowls was open, and I finally got to taste some of the soup that I’d heard multiple locals in Killington – an hour’s drive away – rave about. I ordered an African peanut soup – a delicious peanutty vegan concoction that came in a large coffee cup and provided the most amazingly rejuvenating fuel imaginable for the remaining 3 ½ hours’ worth of driving ahead of me. I queued up another episode of Marc Maron’s podcast and set off for the long haul with a smile on my face. Who knew that a hippie soup truck would be one of the hidden benefits of being a New York City ski bum? All I know is that I will never again leave northern or central Vermont without hitting Smokin’ Bowls for the road. Good work figuring out how to get so many days while living in NYC. I find that a job that gives plenty of time off is important to my sanity. Also, I’ve been feeling the same early season leg burn as you. Even when I come into the season in good shape, the first few days of skiing always hit me hard. I tell myself that it’s important to get out there now, and push myself to ski until I’m tired, so that when the real snow comes, I’ll be able to ski at a high level from bell to bell. Also, not sure if you just taught yourself or if you took a lesson during these 3 years, but a little instruction can help you ski more efficiently, so you don’t have to use as many muscles to get down the hill. Also, I agree, smoking bowls is good. Tip #2 is really Tip #1. I thought it was a smoke shop when I passed it yesterday. I think I might have to try for it next Sunday when I am repeating the drive down from The Beast. Bob at Mt. Sports Inn is a great guy. Great story. There’s a lot more to skiing then just the skiing itself. I have a ton of questions though. What sparked the desire to ski at 42 for instance? Big life change? Health scare? Also, what has been discarded in order to get 70 days in? So many questions.. Are you dedicating all your vacation days to skiing or are you retired? I think I want to see a whole post about your first day skiing. Should be fresh in your memory at least. Thanks for the kind words, guys. It felt great to get back on the hill after so long, and I’m glad you enjoyed the post. Then I remembered that I was a freelance travel writer (most recently for Forbes.com), and I decided right then and there that I would find a way to ski as much as I could with the time I had left – I had four decades of catching up to do, after all. So that’s what I did. I realized that I’m way too old to be a park rat, and I’ll never win a medal in the Olympics, but what I could do is have the most epic first year on skis anyone’s ever had. I decided I would ski 50 mountains my first year, learn how, where, and why to ski, and write a book about all of it. That was 2015, and I’ve expanded the scope since then to a current total of 77 ski areas, thanks to a heroically patient wife, some savings, and the help of dozens of ski industry representatives who when I told them what I was working on, helped out with comped lift tickets here and there. I also make the most out of multi-mountain passes such as the MAX Pass and the Mountain Collective pass, which are fantastic deals if you can put the travel effort in to make them worthwhile. Oh, and we don’t have kids yet, so that’s a big part of the equation, too. I’m shopping the book now. It hasn’t been easy or cheap, but I get by with a little help from a bunch of new friends, and I’ve learned a few money-saving tricks along the way. My next post will be about my newfound love for ski lot tailgating – there’s no better way to meet people or have a great time during a mild day on the hill, and to save the $50 or so I usually spend over the course of a full day of skiing. Leg presses. Squats. Biking, hiking. Enjoy skiing. You remind me at the start of my obsession. If I had all that money today, invested in an index fund, I’d be doing pretty well. But, small price to pay for, as a friend said when I first started, something that makes you look forward to winter, instead of dreading it. Must be tough for a retired dude where I live to be happy on a day like today, even if he/she is active. Grey, dark, nasty, and it ain’t getting better until March. Me, I’m back from a trip abroad, thinking, ok, base is down, cold temps after this rain, I’ll be up there next week. John, this is a great story and me too being a native of NYC and raising my family here, we have always felt displaced as come the weekend we are never around. I started skiing at the age of 6 and now 49 still so look forward to Friday nights driving to the mountains to ski. Dragging our kids over the last 7 almost 8 years to get their fix and now at 8 and 13, our kids are better than us. Would love to get a day on the hill with you especially if you find yourself at PICO. We know the owner of the Mountain Sports Inn and have been to Smokin Bowls a few times – for sure you found to very good spots. Finding your addiction to skiing and riding at 42, well better late than never. Keep up the great stories and reports. Take a looks at some of our video posts on the blog here too if have not already – the one we did with Harvey and Saratoga Skier is arguably our favorite. While the details of our lives are different the basic premise of this piece speaks to me. I also came to skiing later in life and I’ve got strong ties that bind me to a place that is far from the mountains that I love.